Wisdom Audio makes some bold claims for their Adrenaline Dipole 75 loudspeaker. Simply put, they believe it is the finest speaker system available at any price. All manufacturers make claims about their products, however usually in the context of specific price points. 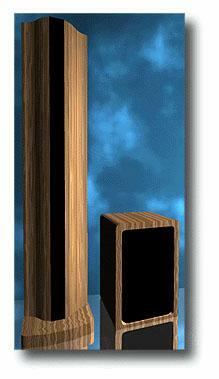 When designing a $5000 loudspeaker, for example, numerous constraints are placed on the designer. Driver quality, cabinet materials, crossover components, construction techniques, etc., are all factored into the equation that eventually leads to a finished product. Statement products, however, are conceived without these limitations, performance goals being the main criteria. Many have suggested that this is actually easier for a designer because when given enough money, anyone should be able to build a great product. In practice, though, simpler speakers often perform better than do complex systems. Witness the number of successful two-way designs currently on the market. As you add components, you add different interactions between those components. A predictable outcome becomes more elusive and your goals for the product more time-consuming to attain. When the goal is, in fact, "The Best in the World," you add greater expectations and a lot of pressure. So does this $25k speaker system succeed? Read on. Tom Bohlender of Wisdom Audio personally delivers and sets up the Adrenaline 75 system in every customers home. As the system is fairly complex, this is a valuable service. The five-piece ensemble includes two planar magnetic panels, two low-frequency regenerators and the active "brain" crossover. Each panel consists of a 75" diaphragm housed within a steel chassis. A 234 oz ceramic magnet is used to control the conductor. All of this dissects two slightly curved wings that rest on a large square base. The push-pull planar magnetic driver is rated to handle 750W and has a sensitivity of 88dB. Horizontal dispersion covers 140 degrees while there is no vertical dispersion to speak of. IM distortion is claimed to be 150 times less than that of a 1" tweeter at high frequencies. Impedance is 5.3 ohms fully resistive, no reactance or resulting impedance phase angle. Translation: Its a fairly easy load for the amplifier. The low-frequency regenerator is a massive sealed enclosure made of 1.5"-thick MDF. The bracing system inside was a collaboration between Dave Kunkle of guitar fame and designer Bohlender. Suffice it to say that the cabinet does not flex or move, and it weighs almost 200 pounds. Inside this fortress are two of the most overbuilt 12" drivers imaginable. The driver magnet assembly weighs 32 pounds alone. Each driver is a cast-frame unit featuring a 3" underhung voice coil. This means a short voice coil in a long magnetic gap is used. According to the manufacturer, this has many advantages such as low distortion, low compression and high power handling. Three large brass spikes are provided to anchor the unit to the floor. The active "brain" is a complex unit with many of the internal parameters set by Tom Bohlender while installing the system. However, for you tweakers, there is plenty left to fiddle with. Each channel is controlled independently of the other, as all knobs are duplicated for both the right and left sides. Starting from the left is the woofer Qb control; this adjusts the woofer level at 20Hz. Next is the low pass, which adjusts the signal going to the woofer amplifier. This will allow precise level-matching between two amplifiers of different powers. A damping control is included which affects the sensitive crossover region. You will notice a variance in soundstage height with incremental changes in the damping. Last is the high-pass knob, which attenuates the signal going to the planar amplifier. The active "brain" allows for precise matching to your room. This gives you far more flexibility than just varying placement will allow. The review sample was finished in the optional piano-black gloss. Fit and finish are superb, as you would expect at this price. Make no mistake -- this is a large system. The visual statement, however, is elegant rather than dominating. I attribute part of this to being a two-piece design, but it also possesses flowing lines that soften the visual blow. This is a refreshing change from the "giant box" syndrome. Break-in was accomplished during the exhaustive two-day set up with a variety of music. This was a fascinating process to watch, as switches, knobs, and placement were fine-tuned to my room. It was readily apparent that something special was happening as the system was dialed in. Bohlender is a perfectionist, as several tracks were repeated tens of times while minute adjustments were being made. I got the feeling Tom was repeating a time-tested process that was clearly designed to maximize performance. Its refreshing to know that you are going to get the sound that the manufacturer intends. Many times the sound a designer or reviewer describes is a far cry from what consumers actually hear in their homes. Certainly, ancillary equipment and room acoustics will cause variance in a products performance. The basic sonic signature of speaker systems, however, should be repeatable with proper placement and in an appropriate system. Final placement had the panels 8' apart and 11' to the listening position. The low-frequency regenerators (LFRs) were placed on either side of and slightly behind the panels. The proximity of the LFRs versus the panels was closer than Ive seen with the big Genesis and Wilson systems. I have a feeling this adds to the feeling of a cohesive system as opposed to most satellite/subwoofer combinations Ive heard. My listening room was designed from the ground up with good sound in mind. The overall dimensions were the only factor I had no control over. The 18' x 14' x 9.5' room is rectangular and symmetrical with no windows. The walls are double-layered sheet rock with additional insulation. The floor has extra decking to reduce flex, and the ceiling has recessed lighting. Dedicated 30-amp lines are run to all amplifiers, and a single 20-amp line to the rest of the components. As the Adrenaline 75 is a biamped system, four channels of amplification are required. Krell MDA-500 monoblocks powered the low-frequency regenerators, and a single Krell KSA-100S the planar magnetic panels. The preamplifier used was the Krell KRC-3 and the source component was a modified Sony ES model. Cabling was from Transparent Audio. A Studiotech rack and a Panamax line conditioner were also used. A large, acoustically absorbent panel hangs on the wall directly behind the listening position. The relationship between the components of the Adrenaline system seems to be a good place to start the description of the sound. The crossover region in a hybrid system has for a long time hampered designers and bothered listeners. The common complaint is that the subwoofer cant match the speed and transparency of the electrostat/ribbon panel. To say the Adrenaline 75 has a seamless transition between the LFRs and the panels would be misleading. In practice, the transition does not exist. I could not detect where one started and the other stopped. The crossover region (variable, but set during installation) was fine-tuned to a degree as to become invisible. The drum solo on Patricia Barbers "Nardis," from her Café Blue CD [Premonition PREM-737-2], spanned the crossover region without a hint of discontinuity. This is a brutal test for a speaker system as the track is very clean but incredibly dynamic. Any weakness in the frequency range would be clearly audible when playing the track. Dynamics are delivered with startling speed and agility. The system can start and stop on a dime. This makes dynamic contrasts exciting, as they should be. Any sluggishness or overhang will dull dynamics and make the transition between soft and loud less apparent, less immediate. When the music demands, these guys deliver with astonishing sound-pressure levels. With appropriate amplification, rock-concert levels can be approached. I could not detect any dynamic compression or congestion with complex program material, regardless of playback level. Listening at lower levels produced good results as well, without any part of the frequency range dropping out of audibility in an unnatural way. Soundstage width was excellent, as you would expect from a dipole. However, I have heard other speakers produce an equally wide effect. Depth of stage is where the Adrenaline 75 system pulls away from other designs. Actually the depth is so distinct, the feeling that you could step behind the vocalist in a jazz ensemble is imaginable. Listen to Holly Coles title track from Dark Dear Heart [Metro Blue CDP 7243 8 57365 20]. Her voice is beautifully recorded with body and substance. The Adrenaline 75 system recreated Coles image within this deep soundstage. Pinpoint imaging fans may be disappointed, however, because you will hear life-size (read: realistic) images rather than needle-point dots within the soundstage. Recreation of the female voice has always been important to me. Diana Kralls recent releases are favorites of mine and also invaluable in the review process. Part of her allure is the natural way she is captured. Kralls voice is not diluted to sound perfect the way many pop singers are recorded. You hear everything, rough edges and all. If your speakers add coloration in the vocal area, they can nag at you like a rattle in your car. You may become used to the sound being there, but it will always bother you at some level. The Adrenaline system passes the "Diana Test" with flying colors. On "Gee Aint I Good To You" from All For You [Impulse! IMPD-182] Kralls voice sounds full and palpable without losing the detail that can sometimes become blunted in other designs. Detail done right is hard to come by. The Wisdom Adrenaline lets you hear detail without hardening the sound in any way. I think this quality contributes to the naturalness in which it recreates the female voice. Male vocals have body and weight that is also very satisfying. Cabinet resonance can sometimes affect this range with a nasal or "cupped hands" coloration. The boxless design of the dipole lends itself to fine reproduction in this area, as male voice sounds open, but not thin. Keb Mo's "Every Morning" from the CD Keb Mo [Okeh/Epic EK 57863] illustrates this distinctly. I heard this track at HI-FI 98, and believe me, if your system does midrange, buy the CD. The treble balance can be described as clear and precise, but not hot. Delicate sounds never become hard or bright. Any graininess up the chain, however, will be reproduced faithfully, as was noticed when some lesser-quality speaker cables were tried, replacing the Transparent Audio cables I normally use. The highs are not rolled off, yet they never sound aggressive. I just cant wait any longer to tell you about the bass these speakers can reproduce. Transparent is not normally a term associated with low frequencies; however, it was the first word out of my mouth when I heard a bass drum reproduced on these speakers. Clean, fast, spine-pounding, yet with no audible distortion, sluggishness or muddiness, is my best description. But it goes deeper than that, much deeper. The manufacturer claims a -3dB mark of 12Hz. Obviously, given the dimensions of my room, I cant get to 12Hz. What my room can support, though, is the best bass Ive ever heard. At HI-FI 98, the three most impressive displays of bass impact were the Martin-Logan Statement, Wilson XS (a dedicated subwoofer), and the Wisdom Adrenaline Dipole 75. Yes, its that good. Try the Patriot Games Soundtrack [RCA 07863 66051-2], but be prepared -- its startling. Or better yet, the dance CD Vegas from The Crystal Method [Outpost 30003]. The track "Cherry Twist" contains some of the lowest, most impactful bass Ive heard. These bass lines were resolved with a nimble, agile quality. This lack of boomy bass had me returning to the term transparent over and over again. This may be in part related to the active "brain" crossover. By fine-tuning the Qb control, the systems bass can be tailored to the room. Maybe the transparency Im hearing in the lower registers is attributable to flattening room resonance. If this kind of active correction produces the results Im hearing, then my guess is that youll see more systems designed with some flexibility built into the speaker to compensate for various rooms. The final test for such an amazing product is the most important. Do I connect emotionally with the music? Loreena McKennits "Dantes Prayer" from Book Of Secrets [Warners 46719] affects me in a way reproduced music seldom does. The Adrenaline system took me to new heights on this recording. I felt emotionally charged the way you do at a live performance. Cool. So does this $25k speaker succeed? You bet it does. This is a reference-caliber system in every respect. Yes, it is expensive, and it also requires four channels of amplification. But some things are worth sacrifice. The Adrenaline 75 is staying in my reference system.